"We had such a great time playing A Will to Murder this past Saturday! The flexibility for characters to make their own decisions (as opposed to just reading a script) is something that the guests really enjoyed. They also agreed that giving the characters certain goals, items, and abilities really helps them get into character, and involved in the game a lot quicker. This has been my third experience hosting a Freeform Game, and it will certainly not be my last (at least not according to all of my friends who said they cant wait for the next one)! I know it is a difficult proposition, but I encourage you to create more games for smaller groups of people – not only because I've almost run out of games to pick(!!! ), but because I know the idea of hosting a game can be a daunting task, and doing so for less people just makes it seem a little more manageable!" "A Will to Murder was my first time hosting and I liked the plot. I loved how new plots unfolded throughout the evening." "I LOVED hosting A Will to Murder. It is my first freeform game, but that is only because I didn't know they existed. I have been looking for something like this for a LONG time! If you want more information on how the game went or tips on hosting it look at this blog post http://halloweenforbreakfast.blogspot.com/2012/01/hosting-freeform-mystery-dinner.html. Hope you love your game as much as I did! I intend to play many more of these in the future :) "
"A Will to Murder was the first game I ever hosted, and it was great. The game is written easily. People did get poisoned, but everyone had a great time and really got into their characters. " "We all had a blast with A Will to Murder! The price, the comprehensive package and the flow all worked so well together." "A Will to Murder, like all the games I've hosted, was wonderfully put together and everyone vastly enjoyed the different plots and twists that occurred throughout the game." 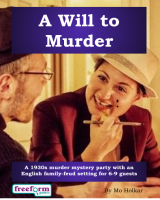 A Will to Murder is a dinner party murder mystery game for 6 to 9 guests and a host – download the free introductory pdf file. Join us in an upper-crust evening of mistrust, family feuding, betrayal, and murder. You will be in the middle of the action and it will be up to you to wheel and deal with the other guests. Can you achieve your goals, keep your secrets hidden and survive A Will to Murder? It's up to you. A Will to Murder is set in the 1930s in Albion House, a stately dwelling in the small English village of Highthorpe. Albion House belonged to Roy O'Leary – who was murdered yesterday afternoon. Roy O'Leary was an elderly and wealthy man, and there are several family members who may benefit from his last will and testament. O'Leary's lawyer has asked the family to gather together at Albion House, the day after the murder, to hear the reading of the will. The police are also present – because the O'Leary family are the prime suspects in the murder case. Everyone listens respectfully, as the Lawyer reads out the will. The main clause is very simple, as O'Leary must have had a premonition or warning of his dreadful end. The whole of Roy O'Leary's splendid fortune is left to whoever identifies his murderer! A Will to Murder lasts for about four hours and is suited to an evening. It is often played over a meal – a finger buffet if possible to allow guests to circulate and talk in private. "A Will to Murder is different than the other murder mysteries. I don't like it to be ALL scripted… this game added more fun when people were able to kill other players or have certain powers." The free introductory pdf file contains an introduction to the game, a cast list of all the characters, and a copy of the Highthorpe Herald – plus details of how to buy the game. A Will to Murder is unlike many murder mystery games. Although the game starts with a murder, some of the characters have more important things to do than to investigate it. And the killing may not be over – it's not certain that everyone will survive the remainder of the evening! A Will to Murder is played just like a murder mystery game. You may be trying to solve the murder, but primarily you are (initially at least) concentrating on your own goals and objectives. Unlike most boxed murder mystery games, A Will to Murder lets you decide how to achieve your goals and thwart your enemies. "A Will to Murder was a really good game. It turned out better than I expected. Everyone who came had an excellent time!" On the evening of the game the guests are met by the organizer, the Lawyer, and welcomed to Albion House. They then receive their detailed backgrounds – including dark secrets, objectives and items. The fun then begins as they form alliances, blackmail each other, steal items and maybe even try to murder one another! Depending on what the players choose to do, there are several different possible endings, but finally everyone finds out how they did, and what secrets everyone else was concealing. A Will to Murder costs £20.00 (GB pounds) or US $29.99. You can buy it in either currency, from anywhere in the world, as you prefer. The price will be converted back into your own currency for you, at today's exchange rate. We offer a Cast Iron Guarantee on all our murder mystery games. If you're not completely satisfied with A Will to Murder then please let us know within 30 days and we will refund you. See our full terms and conditions here.